After my quite spontaneous trip to London, which I spoke about here, it is definitely time for a first street style from there. 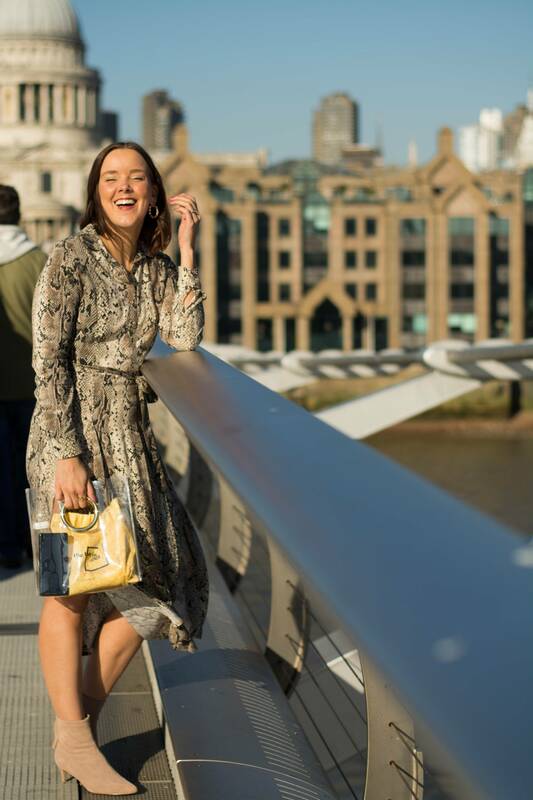 Actually, I just bought the snake print dress in London one day after arrival and we were so lucky with the weather that I could immediately wear it. It was one of those amazing October days where you could just walk along the Thames and stroll through the city, searching for a nice café to grab a coffee in the sun. The snake print is one of the season’s biggest trends I guess – along with the leopard pattern of course. 😉 Actually, I think the snake print is even more diverse as it’s easier to combine and the neutral colors are such a perfect match. And if you’re not in for a dress or skirt, then you should definitely try at least some cool snake print boots or a bag. So what do you think about the snake print- even better than leopard or a no-go? Was ein toller Look von dir! Ich trau mich ja noch nicht so richtig an den Schlangenprint, aber dir steht es so super! Such a beautiful dress & photos too. This outfit is such a lovely change from all of the leopard print that’s everywhere at the moment! OH BABE, nicht nur London steht dir super, sondern auch das Schlangenkleid! Und deine Bilder sind ein Traum! Cooles Outfit, sieht richtig toll aus! Das Kleid ist super schön und die Schuhe finde ich übrigens auch richtig toll! Würde ich sofort nehmen :-). Your snake skin print is so pretty on you. I don’t have anything snake skin, but you are so right when you say how much more versatile and easier it is of all the prints to style. Which makes me want to purchase the print even more. Wow, das Kleid ist einfach der Hammer. Die Farben sind super und ich gebe Dir recht, finde ich auch einfacher als den Leo Print. Obwohl es immer auf die Kombie ankommt. Dieser Look ist auf jeden Fall wunderbar. I love the dress on you <3 really really cool! This look is so gorge, as always! These photos are so stunning! I love the dress, hun! Happy Friday! Auch wenn ich kein großer Fan von Animal Prints bin – dir steht das Kleid fabelhaft und ich liebe den Farbverlauf! Die Schuhe dazu sind ein Traum! I know snakeskin is so having a moment. I adore this dress you have on it looks so chic on you and goes with lovely with your skin tone. And I like the dresses you posted in the feed as well. Thanks for the inspiration. I think that dress is amazing….so beautiful print!!! Das Kleid steht dir total gut =) tolle Bilder! Aww thanks so much babe!! Ich kann gar nicht aufhören, die tollen Bilder anzuschauen. Love the snake print dress, that’s so chic! You look stunning in this snake print, girlfriend! Das Kleid ist der Hammer und steht dir sehr gut! I love the outfit. That snakeprint dress is so amazing. ein super schöner Look mit dem Kleid! v.a. den Schnitt mit der Wickelung und dem Schlitz finde ich sehr cool! The snake print dress is really pretty and you look amazing darling! !